Shaping tomorrow’s transportation. Together. 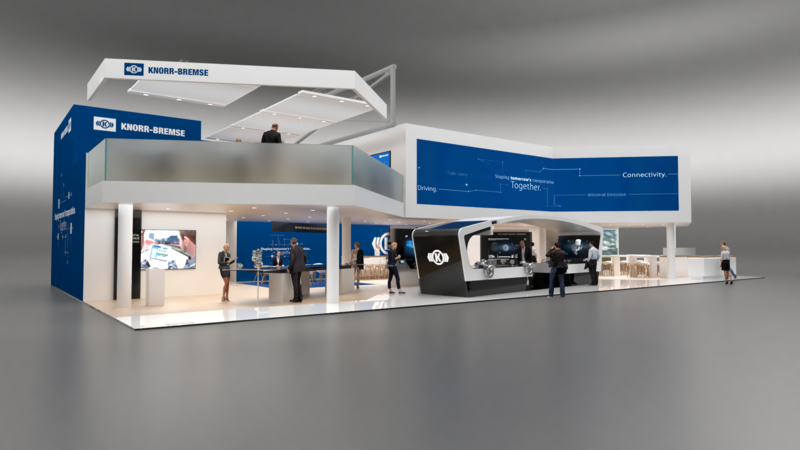 Knorr-Bremse, the global market leader for braking systems and a leading supplier of other safety-critical rail and commercial vehicle systems, is building its presence at the IAA around the key trends in the commercial vehicle market. On island exhibits themed around Traffic Safety, Connectivity, Emissions Reduction & Electric Mobility and Automated Driving, the company is showcasing its latest products and systems with the aid of large-scale touchscreens and interactive 3D animations. Visitors can experience the products and functions with the aid of application scenarios and see how things work in detail. At the Trailer and Aftermarket booth in the outdoor area, the company is utilizing augmented reality to provide insights into the hardware. The core products from the Knorr-Bremse portfolio on the topic of Traffic Safety are on show in the centerpiece of the booth, a stylized truck-and-trailer model. These include the two new disc brakes, SYNACT® and NEXTT®, and the new GSBC brake control system, through which Knorr-Bremse has amalgamated the ABS and EBS system architectures. Other products on show in the context of traffic safety include the steering, the EAC air treatment system with integrated parking brake, and the vehicle environment sensors. Also in the line-up is the new all-aluminum two-piston compressor with clutch which delivers the compressed air and thus serves as the basis for many different functions such as braking, pneumatic suspension, and coupling tractor vehicles and trailers. The aluminum compressor is substantially lighter than its predecessor, contributing to a reduction in emissions. Large-scale touchscreens let visitors dive deep into the details and workings of the systems on show, from compressed air generation via its treatment and distribution all the way to the brake control system and the wheel brake. With the two large touchscreens on the Connectivity island, visitors can take a detailed look at the wide range of functions offered by the cross-brand telematics solution Knorr-Bremse ProFleet Connect®, the SafetyDirect system which is used primarily in North America, and the iTAP trailer remote control system within a variety of application scenarios, sorted by target groups. For fleet operators there are ways of optimizing the coordination of their trucks and trailers, boosting capacity uptake or reducing their administrative cost and effort, each configurable to match the application in question. Drivers can expect benefits such as driving tips delivered in real time, streamlined documentation or wireless trailer control via smartphone app. Visitors can choose from among multiple application scenarios and discover the benefits that the various connectivity solutions can offer them based on concrete examples. Trucks with combustion engines will remain a mainstay of long-distance transportation, while urban deliveries in particular will increasingly be handled by electric vehicles. So the range of exhibits on this island extends from high-precision, rapid-action actuators and intelligent control units to cut fuel consumption in conventional powertrains, all the way to high-performance electrical systems to drive electric vehicles and provide them with onboard power. Also on show are purely mechanical solutions such as Active Caliper Release (ACR) that help improve environmental compatibility and energy efficiency. And there are answers to questions like: Why do the high-precision electric actuators for the engine air management play an important part in attaining the upcoming emissions targets for diesel engines? Or what makes the electrically powered screw compressor so important in electric mass transit solutions? On the Automated Driving island visitors can obtain an interactive overview of established and future driver assistance systems from Knorr-Bremse. They will learn which components are involved, how commercial vehicle driver assistance systems differ from those in cars, and what the technical prerequisites are. The outcome is a clearer understanding of the gradual evolution from more and more versatile assistance functions to highly automated driving. In this sector, Knorr-Bremse has already set a number of milestones in the commercial vehicle market. In 2010, Knorr-Bremse brought the first ever emergency braking system to market; in 2015, the first system that employed data fusion to evaluate a combination of radar and camera data. At the IAA Commercial Vehicles show in 2016, Knorr-Bremse presented a prototype that was able to perform Autonomous Yard Maneuvering, moving fully autonomously within an enclosed depot. That same year, Knorr-Bremse also presented a blind spot assistant that uses radar and cameras to monitor the relevant side of the vehicle. The driver receives a visual or acoustic warning signal if there is a cyclist or pedestrian in the danger zone. Figures from the German Federal Statistical Office for 2016 show that 17% of accidents involving commercial vehicles occur during “turning off, turning round, reversing, maneuvering or moving off.” The blind spot detection system presented by Knorr-Bremse can help bring about a significant reduction in the number of blind-spot accidents involving bodily harm. The prototype truck on show at the IAA 2018 can drive sections of the route on motor-ways/freeways in fully automated mode and represents an important milestone in the development of highly automated driving, which Knorr-Bremse is actively driving forward. The foundations here are provided by Knorr-Bremse’s wide-ranging product portfolio that extends well beyond integrated braking and steering actuation. Even in the (simulated) event of a critical error, the vehicle can continue on its way. With these intelligent redundancy concepts, Knorr-Bremse shows, for example, how the braking system can even temporarily replace the steering in real time. and animated displays that provide insights into the inner workings of individual components and compare the different system generations. Tablet computers help visitors dive into present and future scenarios with the aid of augmented reality. Then there is the extensive portfolio of professional maintenance and repair services and the cross-brand telematics system Knorr-Bremse TruckServices ProFleet Connect, as well as the intelligent Trailer Access Point (iTAP). Come and see Knorr-Bremse at the IAA Commercial Vehicles show in Hanover from September 20-27 on booth A30 in hall 17 and on booth D107 in the outdoor area.